Runner’s World Has Social Media Klout. Runner’s World (RW) has a Klout.com score of 77. http://beta.klout.com/runnersworld. Klout measures Online and Internet Influence. A score of 77 indicates that the RW Social Media (SM) model, strategy and team are working well for parent company Rodale after just one-year’s time. I spoke with RW Director of Communications David Tratner about their SM efforts. David said that their SM measurable results have provided data that has shaped their Internet strategy. SM Editor Susan Rinkunas has done a marvelous job of engaging the RW’s online community. By analyzing the SM reports and numbers, she is able to understand better what times her online communities are most often looking at their PCs, Macs and smartphones in order to find out what new RW content has been posted. Susan is then able to maximize their SM marketing campaigns by providing sticky content when the most viewers are actually online. Everyone, including sponsors win with this smart sportsbiz strategy. 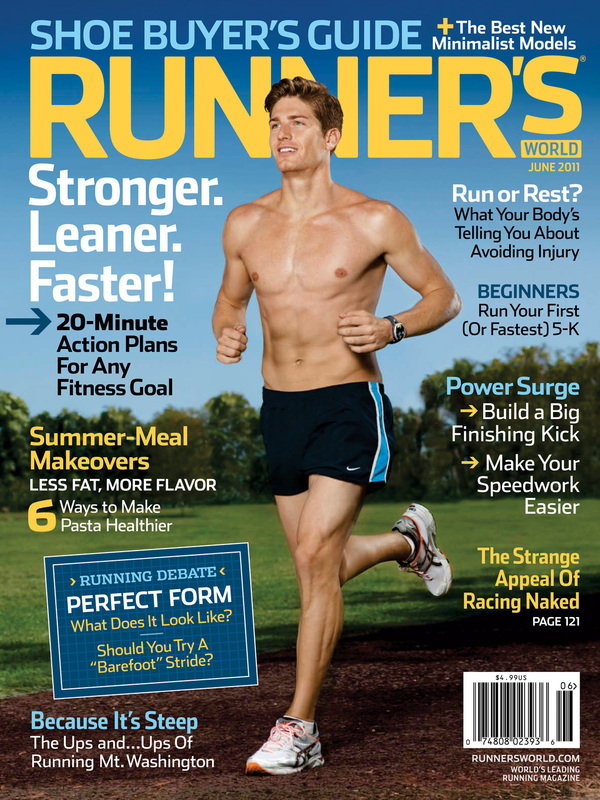 During the Easter weekend, the Runner’s World Magazine Facebook (FB) page tallied over 200,000 total Likes. 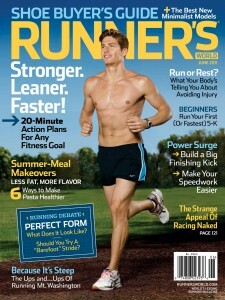 http://www.facebook.com/runnersworldmagazine. They are averaging about 10,000 new Likes per month. The magazine’s FB page has an approximate audience user engagement rate of 66 percent. Thanks to the SM teams hard work posting compelling content, the timing of the Boston Marathon where they provided Live updates, combined with the beginning of good weather; April saw a spike of an additional 30,000 FB Likes. 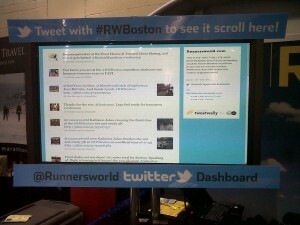 During the Boston Marathon in April, RW used a Tweet board that allowed runners who used the Twitter hashtag #RWBoston to have an opportunity to ask their magazine editors questions and see responses displayed on the booths HD displays. This cutting-edge marketing concept resulted in 8,000 new April Twitter followers. RW now engages with over 80,000 Twitter user names. 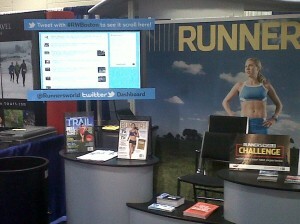 http://twitter.com/runnersworld. SWAG is a universal love and RW sponsored a Tweet up at the Puma Store in Boston that further engaged their followers with free gifts and audience participation. Thinking outside the box is status quo for RW. Their SM team came up with a promotion after Easter weekend to celebrate busting the 200K mark in FB Likes with a marketing campaign that gave away a free issue to the first 200 U.S. residents who signed up. This was such a viral hit, 600 new subscribers signed up. Next, via FB and their web site at http://www.runnersworld.com/, discounts to RW branded books titles were offered over the next 200,000 seconds or 55.5 hours. 200 different books, training plans and Challenge packages were sold. Makes you wonder what RW will do next when they hit the 300K mark on Facebook. The Runner’s World Challenge is an exclusive promotion for you to be coached virtually by RW Chief Running Officer, Bart Yasso. You can also train with the RW editors and get expert advice on how to improve performance, optimize your nutrition and prevent injuries. Training for the Chicago Half-Marathon starts on July 4th. http://challenge.runnersworld.com/. The Chicago Marathon will be run in October and RW will be there with a significant presence while providing more SM content and engagement opportunities for both runner’s and fans. David said that RW is dedicated to staying on the forefront of the latest technology. They offer free iPhone and iPad apps and are working on coding a new Android mobile application. The digital subscription challenge RW and other media companies such as Hearst, Time and the New York Times are undergoing is trying to strike a balance between free and paid content. Currently, RW touts 2 million readers and 700,000 subscribers. The competition for runner’s eyeballs, feet and mindshare is fierce. The competition is certainly out there, however, they will have to sprint at least a 10K in order to catch up to RW’s Big Mo that Social Media has provided. Keep looking at their impressive Klout score and you will be able to better gauge how their latest SM efforts are paying off. Big shoutout to Joe Favorito – @joefav for the intro to RW and David, thanks for the opportunity.